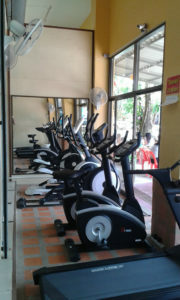 Koh Chang Gym is located in Klong Prao, west coast of Koh Chang in Thailand, just on the main road and on the opposite site of Klong Prao Resort. For more information how to find us just look at our Contact page! The gym is opened daily from 9.00 am to 8.00 pm all year long. There is a free parking space in front of our gym where you can park your car or bike. The gym is clean, spacious, cooled with fans and on 2 levels. On the first floor there is all the heavy equipment with the treadmills, bicycles and cross -trainers. On the second floor there is a mezzanine with a rowing machine, another bicycle and place to stretch. You are free to bring your own energy and protein drinks but if you need we are also selling some of them. We have different types of non-alcoholic refreshment and we are doing protein shakes. We recommend you to bring your own towel but we are also renting them out. For hygienic reasons we are asking to use a towel on the benches.